Every week on First Sight Saturday I feature an excerpt of a first meeting between two important characters. This week I welcome an author I’ve met in person. We are on an author loop together and, while discussing local book events, figured out we live maybe 15 miles apart. Awesome! 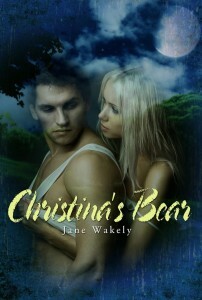 Anyway, Jane Wakely shares with us today an excerpt from Christina’s Bear, her paranormal shifter romance. Christina jumped and opened her mouth to scream when a strong hand carefully closed around her wrist, effectively stopping her from shaking and splattering anymore scalding liquid out of the lid. For some reason, the mammoth hand brought the image of a giant animal paw to her mind. His skin was golden brown, as if permanently kissed by the sun. The only people in the Pacific Northwest with that color skin tone regularly visited tanning salons. She knew he hadn’t. Wanting to see his face, her eyes moved up and up and up. She was six feet tall, but he was taller. Much taller. If she had to guess, she’d say he was about seven inches taller. She quickly glanced at his feet before meeting his eyes and she saw his mouth turn up in a smile on one side. This man was humongous—and it seemed he was that way everywhere. Christina actually felt petite. She’d never felt that way in her entire life. Deep chocolate, almost black, warm eyes stared back at her. His black hair was cut short on the sides and it spiked out on top with the help of a styling product. He was absolute perfection and Christina had to consciously close her mouth and swallow to sooth her parched throat. His hand still held her wrist and she was sure he could feel her rapidly beating heart. “Who’s Derek?” He asked again, and though she didn’t know him, she opened her mouth to answer. Christina Mills’ loud, bubbly personality gains her numerous friends and dating opportunities. Unfortunately, being labeled a “party girl” and dating a lot can give people the wrong impression. When Christina’s dates learn the truth about her, they soon move on. James “Bull” Johnson is a restless bear shifter ready to settle down. At the urging of his friend, he relocates to the mid-sized town of Chestnut Rock. Bull hopes the nearby forest and being near his best friend will help soothe his bear and cure some of his loneliness. When Bull and Christina meet, he recognizes her as his mate. However, their first two encounters leave Bull thinking Christina is afraid of him and Christina is confused by her feelings toward the stranger. Both Bull and Christina have secrets and insecurities that keep them guarded, but if they can trust one another, they’ll discover they’re made for each other. You can find Christina’s Bear at the following vendors. To stay in touch with Jane Wakely, you can visit her blog at www.janewakely.blogspot.com, her Facebook page at www.facebook.com/JaneWakely, follow her tweets at www.twitter.com/JaneWakely, or find her Goodreads page at www.goodreads.com/JaneWakely. Historical Titles on Book Lover’s Buffet!